By early March, my winter outfits become pretty repetitive. My camel outerwear is worn on repeat, and my black jeans start fading to blue. A girl can only afford so much cold weather clothing (spring, I'm ready for you). I recently purchased this bolo necklace for about four dollars to spruce up the basics that permeate my closet. I am not one to try out many new trends, but if I can join in for such a wallet-friendly price, sign me up. As I've said before, I'm all about adding some personality to even the simplest the looks. Which new accessory should I try next? 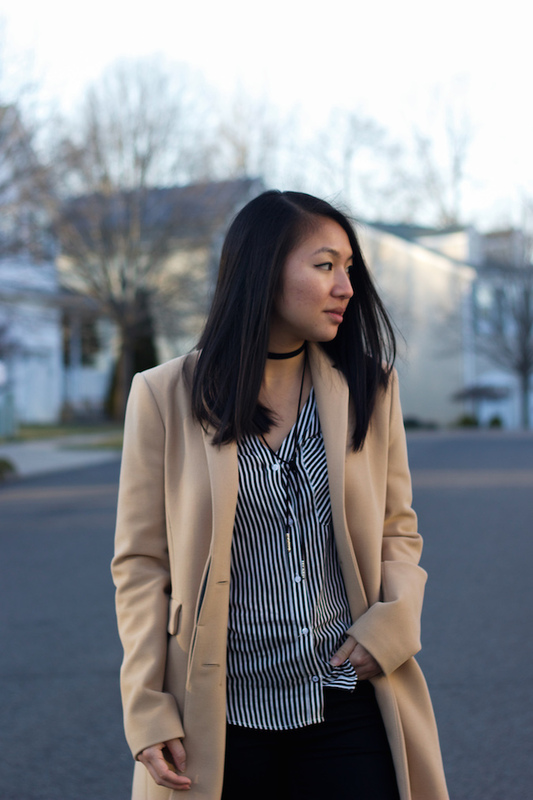 I'll never get sick of a classic camel coat thought! That necklace is statement, love it! This is such a cool look - love the stripes! love the look. that coat will never go out of style. what a great deal on that necklace. I love wearing watches. even though its a bit expensive they will never go out of style. I totally agree!! A great watch is a classic accessory! Love your coat and shirt! Looks stunning! Gorgeous necklace but I must say, your outfit in its entirety is totally on point! Very chic look. I likey. I love this look! The necklace is SO cool! Bolo necklace seems pretty nice. Love this classy look Christina.